So, there's this accident, and now Obama plans to ban offshore (deepwater) drilling. If there's a major tanker accident on an interstate that spills oil (or some other environmental toxin), will we ban the use of tank trucks on the interstate? Why haven't we banned the use of alcohol when a person KILLS another person from driving under the influence - or perhaps privately owned vehicular transportation altogether? I think I've found the missing child mentioned in this article! It looks like my 3rd child! I think he time traveled into the future! In other news, a Madagascan bird has gone extinct. Supposedly this is due to introducing carnivorous fish to the largest lake in Madagascar. I wonder what King Julien would have done about it? The most fantastic thing about this news report, though, is the name of the communications officer of BirdLife International that was quoted in the article: Martin Fowlie. Also in short supply is paint for restriping roads after construction or reconstruction. From the article, "Without adequate markers, drivers can drift out of their lanes and cause accidents." Really. Um, I thought things like inadequate sleep, distraction (such as blogging, texting, talking on the phone, and facebooking) or inattention, and intoxication (whether alcohol or drugs) would be to blame for the drifting. But back to the oil for a moment. Check out this page, which contains a video of and excerpts from a speech by President Obama, in which he makes this startling observation (regarding BP's top-kill attempt): “If it’s successful — and there are no guarantees — it should greatly reduce or eliminate the flow of oil now streaming into the Gulf from the sea floor.” Really. Um, isn't "greatly reducing or eliminating the flow of oil" the definition of "success" related to this top-kill effort? And if you haven't checked it out already, be sure to read my previous article, where I mention the likelihood of government censorship over a CNN article in which the president blamed America for the spill ("He also blamed the failure of the country to transition away from fossil fuels toward green technologies"). Who's responsible for the oil leak in the gulf? According to this news article, Obama "blamed the failure of the country to transition away from fossil fuels toward green technologies." That's right: the President blames the American Public for the oil spill. : Apparently CNN was pressured to remove that statement from their article, as it no longer exists there. You can see the original version here, which includes the missing paragraph: "But he blamed more than BP. He also blamed the failure of the country to transition away from fossil fuels toward green technologies." CNN's article has been rewritten. You can possibly still see the CNN text highlighted at a specific Google search, from when the article was originally indexed by Google, but who knows how long until that page is reindexed and the text disappears from Google's search engine. Hmm... wonder who's bullying the media into reporting only what they want reported? Really? That's the best our media can come up with at the moment? I guess it's better than some of these headlines and stories. Well, take a look at this video of BP engineers (or somebody at BP) remotely modifying the blowout preventer valve a mile beneath the surface of the ocean. Pretty interesting, really, but what I want to mention is this: doesn't this look like something NASA could do? Or even has done, just in the near-vacuum of earth orbit (vs. the tremendous pressure of being a mile down in the ocean)? Point is, it's remotely operated vehicles performing maintenance tasks. I know that frequently the astronauts use spacewalks... but also, frequently, they use remotely operated machines to perform maintenance tasks. Surely NASA engineers and astronauts would be capable of operating these underwater ROVs as easily as operating space-ROVs. In other words, the government DOES have the capability of responding to the underwater well leak, just not in the typical capacity. Thinking "outside the box" affords the experience, capability, and expertise to respond. Here's the BP live video feed of the oil leak under the gulf. Why not take something "like" a balloon, something expandable (but obviously more rigid), stuff it into the main broken riser, and expand it? If it's, say, 6-12 feet in length, there should be enough force/friction on the sides to keep it from being blown out by the oil in the riser (of course, I could be wrong, as I don't know the exact pressure). Sort of like one of those "drain unstoppers" of heavy rubber that you connect to a hose, insert in the drain/pipe, and turn on the pipe - it causes the rubber to expand, blocking backflow, and pressures the blockage through the drain. This would be similar, but only for blocking. Why not crush the pipe? It wouldn't stop the leak, but it might slow it a bit while they're working on the other alternatives. That's all for now, about to head out to lunch. Well, the oil feed is live. Well, it was for 43 seconds. Shortly after the feed went live on a gov't web site (since BP apparently didn't want to host it), the site was overwhelmed by web traffic and broke. The live feed is still not working at the time I'm writing this. However, BP has said, "We're capturing 5,000 barrels of oil per day through the suction tube." And the video shows (well, showed, for 43 seconds), significant remaining leaking oil around the siphon tube. Guess they were wrong about the estimated flow, eh? Why "initially unrelated"? Maybe they'll design bacteria that will alleviate the need to drill. Maybe they'll design bacteria that can eat away spilled oil without having to absorb the oxygen in the water. Maybe they'll design bacteria that will turn corn into pixie stix! Now THAT would be awesome! Go science! Hope this turns out well in electronic photo form; I'm sure it's nowhere near as beautiful or majestic as in person. 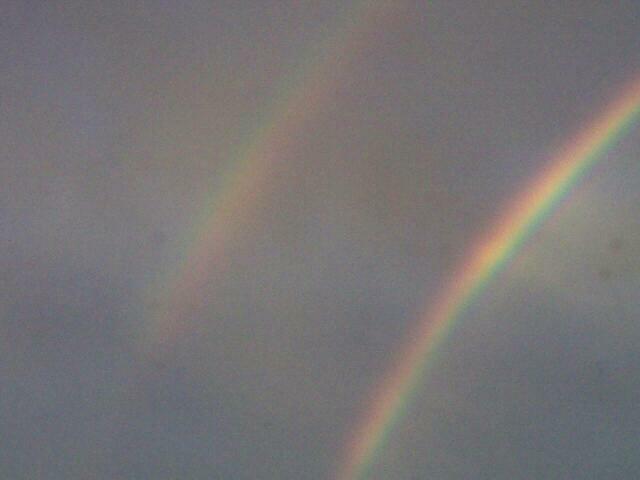 The lower one is very bright and full across the spectrum. Saw this today. Found it amusing. 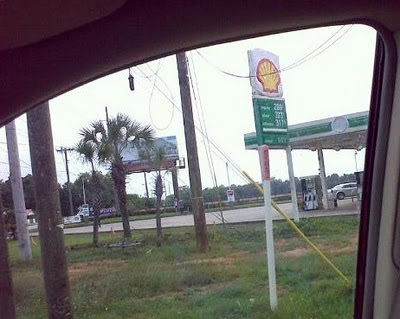 If you can't tell, that's a Shell logo wrapped around what used to be a BP logo; the rest of the station still has BP Green all over it. 2 cents ... what's 'at worth, anyway? Before I offer my 2 cents on the topic that you'll discover momentarily, what's 2 cents worth anyway? Less than one percent of a gallon of gas (or milk, for that matter)? You can't even buy a pair of gumballs for two cents anymore. Are we all saying our thoughts are totally worthless? In many cases, that's probably accurate... but even so, maybe we should revise our cliche, increase thought value due to inflation. How long has "two cents" been around (the saying, I mean)? From this site, it started as "two bits" (English version) and "two cents" is the Americanized version. Anyway, it says the first US reference he could find is from 1926. From this site, $0.02 in 1926 would be equivalent to $0.24 in 2009. So maybe, instead of my two cents worth, I'll offer you my quarter's worth (and maybe it should be a dime and two pennies for your thoughts instead of a penny for your thoughts, although that's quite a mouthful, so I propose we just make it a quarter all the way 'round: my 25-cents worth, and a quarter for your thoughts). So, on what am I offering my quarter's worth? The BP oil spill. Or is it the Transocean spill? Or the Halliburton spill? Regardless, it's a bunch of oil spilling into the gulf. Well, best I know, it's actually been pressurized and is now venting into the gulf. Regardless, BP has some options; they've discussed the "junk shot" or "top kill" method, which would be firing "junk" into the leaking pipe to plug it up. There's also a possibility of pumping cement into the blowout preventer valve (I don't have all the links right now, and I don't feel like digging them up, as I'm watching TV while writing this, so I'm distracted enough without Googling all the links). Personally, I thought about taking something stiff-yet-expandable, maybe six feet long, shoving it into the leaking pipe, and then inflating it, pressing the expandable "balloon" to the sides of the pipe and stopping the leak. Why haven't they tried these methods (or anything else of this nature)? Why do they keep trying the "let's find a way to funnel the oil back to the top" to "stop" the flow? Well, it's for the 2 cents I haven't quite given you yet. If they can get the oil to the top, they'll hopefully find a way to separate it and refine it and make a profit off it. They've started the "secondary wells" to relieve the pressure to stop the leak (by bringing the oil up through the new wells). They tried the large dome (which clogged with ice-like hydrates) to funnel the oil to the surface (to be collected into a receiver ship for processing). They are now trying to insert a new tube into the leaking riser which will allow bringing the oil to the surface (to be collected & processed). Why haven't they plugged the leak? 'Cause that would mean the oil is stopped, and they couldn't get it back. Surely you don't think they'll be permitted to drill again immediately after getting the leak stopped? Thus, if they "fail" to stop it, all the while drilling the secondary wells to "relieve the pressure" and stop the leak, well, then they'll end up with functional wells to replace the one that's been damaged. Am I way off here? I'm thinking it's still about profit for BP and maintaining access to the now-pressurized but leaking-into-the-gulf oil reservoir. 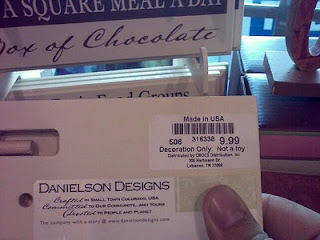 In case you can't read the label, it says, "Decoration only. Not a toy." You know, in case you were confused, and wanted to play with the desk plaque, you have the warning on the label. 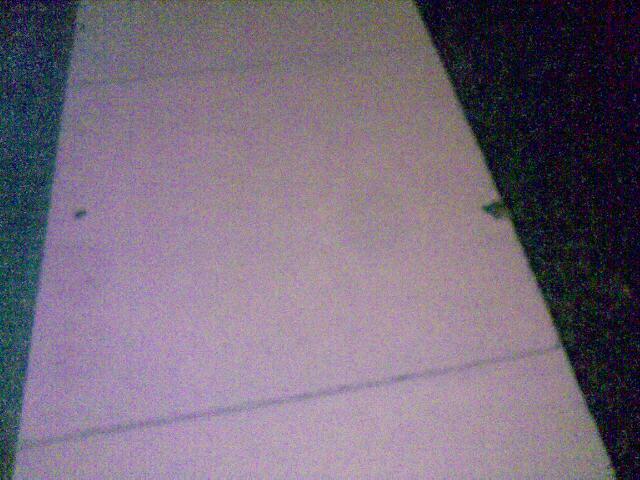 Probably hard to tell, but the two blobs on the sidewalk are frogs. I'm out walking, and walked right between these guys, who didn't move at all while I went between them. Yes, I'm walking on the uneven, unlevel sidewalk, not illegally in the street. And, yes, I'm texting while walking. So, I'm looking at this AP news release, and I find yet again common grammatical and spelling mistakes in publicly released information. It says, "Thousands have fled there homes in Nashville..." - that should be "their," not "there." That's a common mistake that thousands of English textbooks across the US have included in their (not there) "common mistakes" listings. I am curious, though, why these types of mistakes are made in formal publications (vs. informal communication, such as email or instant messaging). I mean, this author is, presumably, paid to write for a living, yet he can't seem to take the time to proofread a four-(short-)paragraph article. Am I being overly critical here? Or perhaps a little AR or OC? Is it really too much to expect that JOURNALISTS would actually PROOF-READ their (not there) articles BEFORE publishing them? Have I already blogged this before? Can't recall. Anyway, read the instructions: "now you can pick up anything!" Need to move your house? 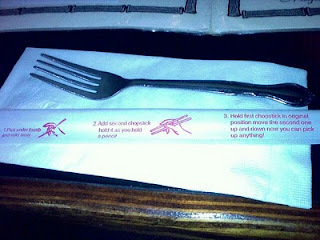 Use chopsticks! Car in the way and lost your keys? Grab some chopsticks and get it out of the way! Spilled your drink? 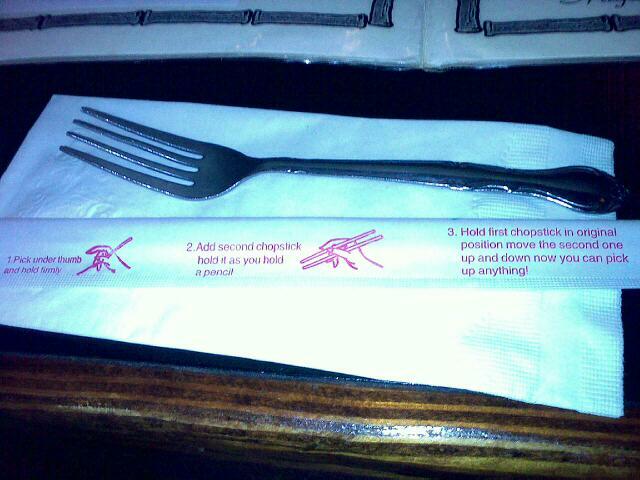 No problem, pick up the fallen liquid with your handy chopsticks! Keep a pair handy for all your pick up needs!